Samira Ahmed becomes the new presenter of Newswatch this week fronting the weekly programme which aims to hold BBC news to account. The programme had been presented since launch in 2004 by Ray Snoddy. It was launched in the wake of the Hutton Report as a way to foster more accountability for BBC News. 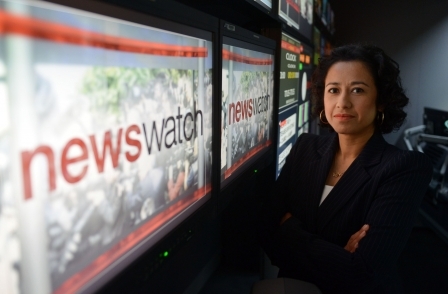 Samira Ahmed officially becomes the face of Newswatch this week as the programme settles into its new home in New Broadcasting House. Newswatch aims to hold BBC News to account, presenting viewers' opinions directly to journalists and editors and hearing lively debate about how different stories are covered. Over the next few weeks, Newswatch plans to explore the BBC's coverage of stories such as the US presidential election, the conflict in Syria and the on-going economic problems of the Eurozone. Newswatch is broadcast on the BBC News Channel on Fridays at 8.45pm and during BBC Breakfast on BBC One, Saturday mornings at 7.45am.